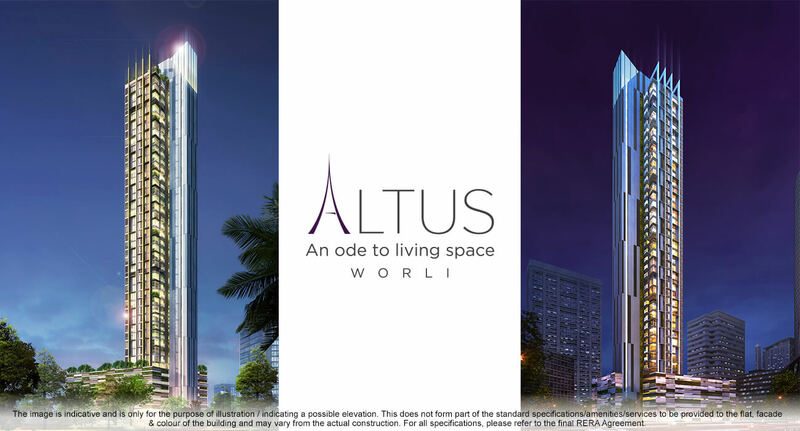 Located in the heart of Mumbai’s Golden Triangle, Altus is located right at the intersection of the high life of Worli and business end of Lower Parel. Altus would an address which will be desired by many but enjoyed by a chosen few. The project would have unobstructed 270 degree views of the city skyline merging into the calm horizon of the Arabian Sea. With a location where Mumbai comes knocking at your doorstep, Altus is already being said to be one of the best properties in Mumbai. The homes on offer are lavish and spaciously planned 3 BHKs and just 2 units per floor with its own individual lift lobby and a shared floor lobby that respects the privacy of each home. Being close to several well-known restaurants, schools, hospitals and malls our project is located in one of the most buzzing areas of Mumbai. Disclaimer : JP Infra Mumbai Pvt. Ltd., (JP Infra) has expressly informed you that the selling price/interest rate/subvention period/discounts/specification/design/amenity/facility/offer are indicative only and may vary in reality depending on various factors including but not limited to notions in home loan, interest rate, home loan disbursal, time, etc. The selection and allotment of an apartment is subject to realization of the booking cheque, subject to availability and final confirmation from JP Infra and JP Infra at its sole discretion may choose not to confirm an expression of interest (booking cheques) without assigning any reason whatsoever. JP Infra reserves the right to release only a specific number of apartments under this offer or alternatively may increase the number of apartments under the offer, without any prior intimation to whomsoever. The statement, information, and subsequent information provided is indicative. Details given in this information is/are neither an offer nor a contract. Statements in this release may involve a number of risks, uncertainties and other factors that could cause the actual results to differ materially from those indicated herein. JP Infra undertakes no obligation to update the statements made by it to reflect events or circumstances. This document is confidential and personal to the addressee and is not to be subject of communication or reproduction wholly/ in part. All marketing collaterals/brochures are only indicative and conceptual in nature. Errors & Omissions Excepted.